It's hard to be 'blue' today, as it marks the 3rd anniversary of mine and Brian's engagement. 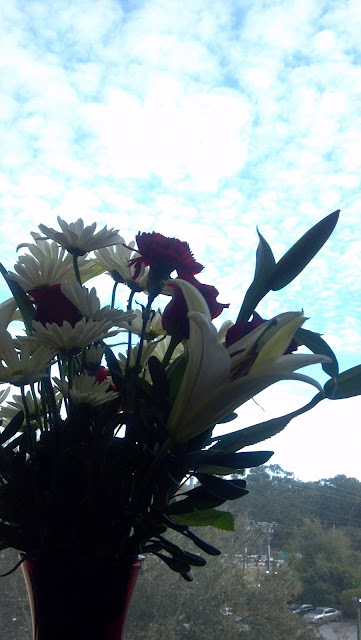 He mentioned this morning that he had made dinner reservations, and then when I got back to work from lunch this afternoon, this lovely bouquet of lilies, daisies, and roses had been delivered. I'm truly a lucky girl! I know that not everyone celebrates their 'engagement anniversary', but it's our tradition for celebrating Valentine's, and we are able to beat the crowds by heading out the night before! Um, one more random thing... weird that this showed up in Brian's inbox today. Somehow our brother-in-law John got his hands on this photo of Brian as a child! Brian does not recall exactly what was going on in this photo, but the point is that he is BLUE! How appropriate!